Is this the real life..
1. [+99][-5] Sh*t.. He has a really nice skin..
2. [+98][-5] What should I do when he's looking handsome like this..
3. [+96][-5] He's a man but why does he look so prettyㅠㅠㅠ I'm feeling ashamed of my ownself..
4. 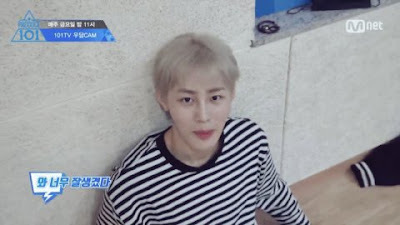 [+30][-0] He reminds me of Exo's Suho, not because they look alike, but because of the similarity they have. Both of them have a really clear and porcelain-like skin, delicate facial features, and the combination of handsome and pretty..
5. [+27][-0] If that's how he looks like with no make up then I have no other choice but admit that he's handsome..
6. [+26][-0] I started to stan him because of his voice but I'm starting to fall for his visual these days..
7. [+21][-0] Yes, this is the real life.. not fantasy..
9. [+19][-0] Look at his visual.. Is this the real life..